It takes a whole ten minutes after landing on Lady Musgrave Island for me to embarrass myself. My embarrassment becomes more acute the longer I stay on the island and become familiar with its inhabitants. Instinctive and well-intentioned, nevertheless I feel a fool. The ‘water taxi’ deposits campers and their gear on the eastern shore beach which requires a short hike across the island to the west coast campsite. Heady with the screeches and smells of gazillion seabirds, we pass through a shady pisonia forest. Glimpsing a distressed noddy near the path with a tangled mess of sticky twigs caught up in its wings I try to untangle his feathers. Roping in another new camper straight off the boat, eventually we give up and watch him limp away, most likely to die amongst the forest floor rubble. Oblivious to the poop dropping onto my back, later on I’m thankful that I’m wearing a hat. Standing up I take a look around and realise my error immediately. The forest floor is actually littered with bird carcasses in various states of decomposition. There’s also a sign that I missed earlier which advises visitors that what we are seeing is a common occurrence and that “interference is unwelcome however distressing it may be to witness.” Guiltily I feel chastised. Continuing through the forest the number of birds in various distressing stages of entanglement is obvious. I try not to look at them. Emerging from the forest it doesn’t take long though before this tiny speck of sand barely rising above the Coral Sea has revealed her ample charms. Jim Buck, who acts as camp host with his wife Annie, but whose real purpose in life is turtle research, greets us with friendly eyes, a warm smile and a firm handshake. A fresh dollop of bird poop has settled on his chest which distracts me as he shows us the available campsites shaded by pisonia forest. 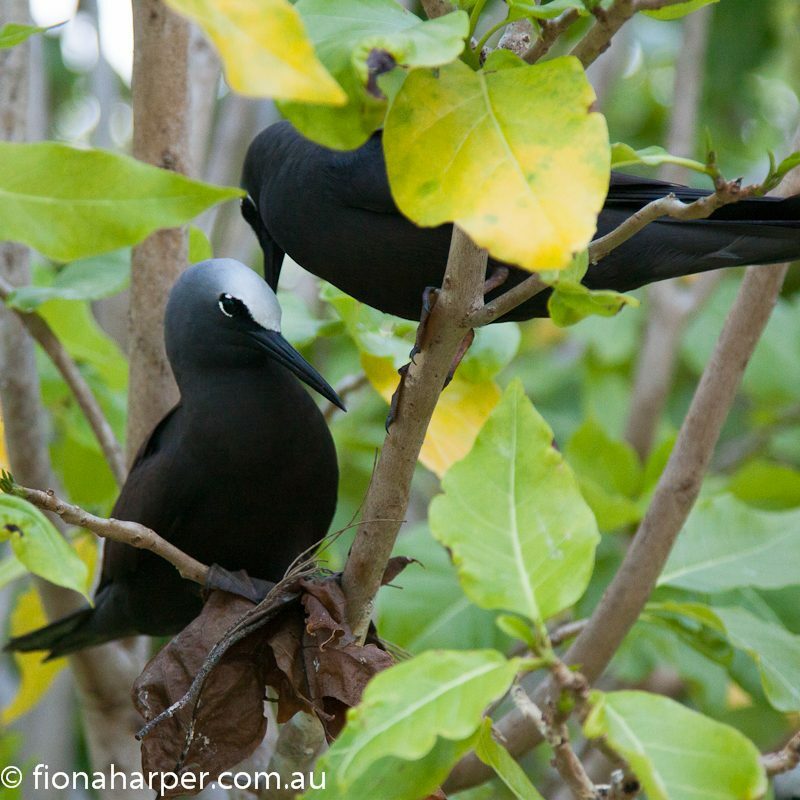 I soon learn that bird poop is an integral part of the Lady Musgrave Island experience. Though I do eventually get used to sloppy droppings dripping down the tent, dollops landing in my shoes and congealing in my hair if I’m foolish enough to forget my hat, I’m not entirely thrilled about such close encounters. A strong guano odour dominates our campsite. But it’s easy to forgive the inconvenience of bird poop by simply walking a dozen or so paces past coastal sheoaks and pandanus palms onto what must surely be one of the prettiest beaches on the planet. 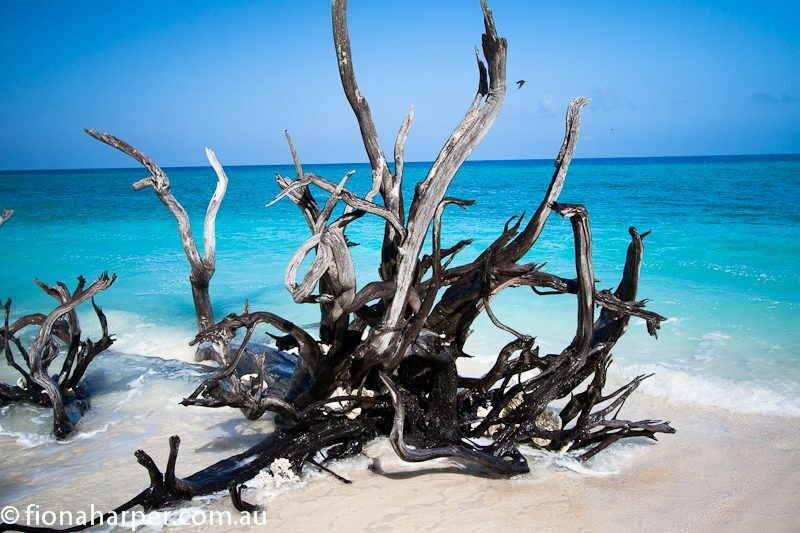 At high tide, powder-soft sand kissed by turquoise water wraps around the point near the campground, broken intermittently by lifeless tree trunks wedged into the sand. 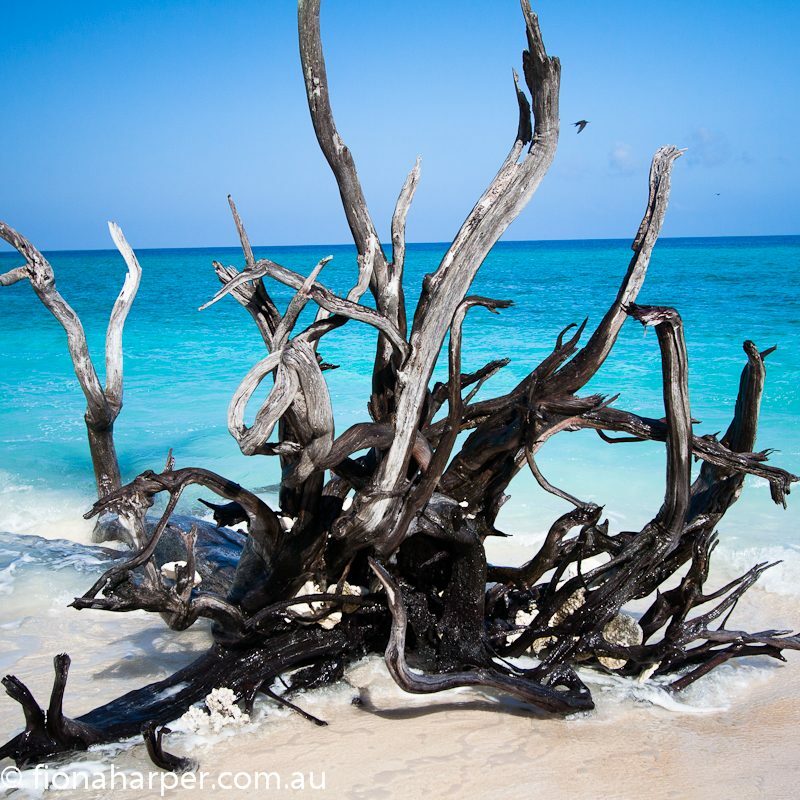 Plopped on a smooth trunk above liquefied aqua in the shallows I never tire of gazing at the intensely blue sea. Mesmerised by this saltwater beauty, I’m rewarded with gasping turtles breaking the surface but so too a pirouetting ray rising out of the sea like a graceful albatross before quickly disappearing again. Beyond the reef a couple of bumps signify Fairfax Islands, otherwise the entire horizon is consumed by monotonous sea. At low tide the seascape changes as the fringing reef pops above the surface. A vast kidney shaped lagoon is one of the main attractions for both humans and wildlife. For boat owners, the lagoon offers one of the few coral cays with a navigable anchorage. But the real attraction is the marine and bird life that thrives in this self-sustaining ecosystem. 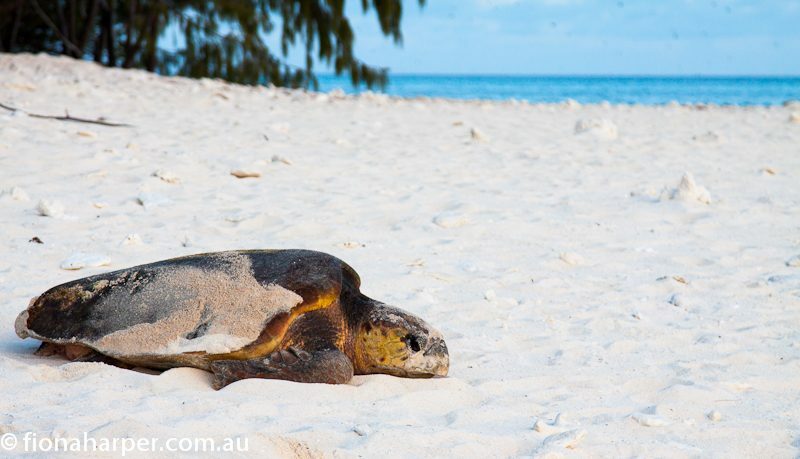 The island and lagoon are a significant rookery for green and loggerhead turtles, but so too for seabirds that annually migrate to the Torres Strait islands and beyond. If you were in a hurry you could walk around the entire cay in around 30 minutes. But what would be the point of that? There’s no reason to shift beyond first gear on this castaway-like coral kingdom. Much better to dawdle, poking around the high tide mark, checking out turtle nesting tracks, watching oyster catchers and shearwaters, wading in the shallows or snorkelling over coral gardens in the lagoon, allowing the magic of this coral cay with a colourful history to work its charm. The original Lady Musgrave was the wife of Sir Anthony, Governor of Queensland in the late 1880’s. Lady Jeannie Lucinda was rather fond of hosting lavish soirees on Brisbane’s Government House lawns, presumably the perfect hostess playing a support role in her husband’s stellar career. Strongly opposed to the women’s vote, after the death of Sir Anthony she moved to England in the early 1900’s, becoming president of the local Suffrage League. I wonder what she would have made of two women travelling unaccompanied on a girls getaway to the island that bears her name. I suspect Lady Jeannie would not approve. It’s not known if she had any inkling of the destruction reaped on the island bearing her name while she was abroad suppressing women’s independence. Guano (concentrated, aged bird poop) miners harvested the islands bounty from the early 1900’s, abandoning their goats purportedly for the benefit of shipwrecked sailors. The goats quickly stripped the island of undergrowth, resulting in a massive impact on the delicate ecosystem. Later, a couple of simple cabins became rather grandly known as a resort, which attracted the rich and famous before closing permanently before WWII stymied such indulgent pleasures. American author Zane Grey was surely inspired by the island as he penned his adventure novels. Multi-millionaire bookworm and financier behind what eventually became the New York Public Library, George Vanderbilt also visited. With a couple of days to do nothing but chill out in this wildly remote paradise, I’ve a desire to bury my own nose in a good book but there are surprisingly several distractions. Our first dinner is interrupted when Jim alerts us to a turtle making her way up the beach. Beneath the sheoak trees a lumbering loggerhead is flinging sand into the air as she digs a pit with her rear flippers. We watch as she patiently deposits a clutch of a hundred or so eggs before using her flippers cleverly to protect and conceal her nest. It’s a moving experience that leaves me feeling humbled and extraordinarily privileged as she drags her cumbersome body back to the sea. An endangered species, Jim tells us she’ll be back in another two weeks to repeat the performance. Jim and his dedicated volunteers record every turtle that comes ashore, providing valuable data that will assist the long term survival of these magnificent creatures. He and Annie have been committed to the island and its wildlife for twenty years and seem to have an intimate knowledge of each species behaviour. They return to the mainland after a month on the island on the same boat that my friend and I depart on. Helping load and unload their copious amount of gear, my own ignorance upon arrival remains a secret I dare not confess. Lady Musgrave Cruises takes day trippers as well as campers to the island from Town of 1770. Campers gear is carried at no extra charge (within reason). Campsites and boat transfers should be booked well in advance. The campsite is located on the western side of the island with capacity for a maximum 40 people. Most sites are shaded, though you’d be wise to take a large tarp that can be strung above your camp to avoid dropping bird poop. Campers need to be entirely self-sufficient and provision for the possibility of staying longer than planned if bad weather postpones the daily boat from 1770. The only facilities are three composing toilets and an emergency VHF radio. Take in all food, water and supplies and remove all rubbish on departure. Mobile phone coverage is a slight possibility if conditions are perfect. The island is closed to campers from Australia Day weekend through to Easter to avoid interference with nesting wildlife. The best time to go is April or May when it’s not too hot and the water has not yet cooled to winter temperatures. 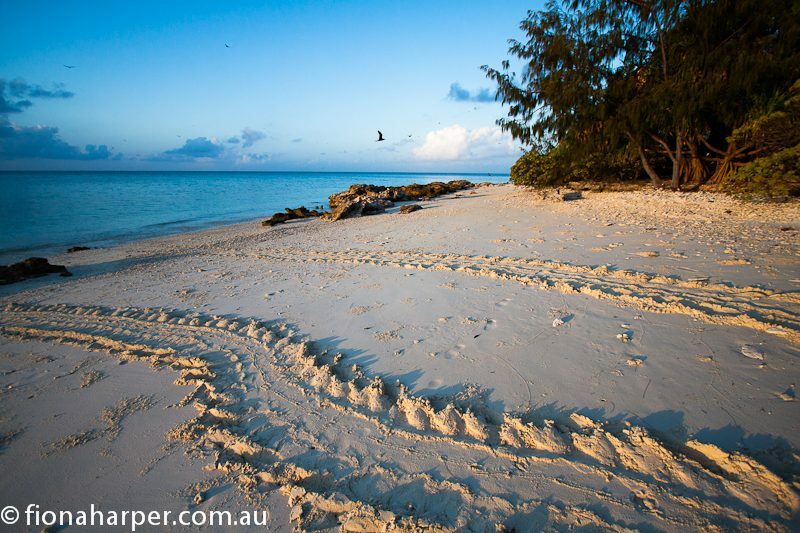 Turtle nesting and hatchling season is generally between November and April. Fiona Harper was a guest of Tourism Queensland and Lady Musgrave Cruises.